Originally numbered as the 10th Army, this Army formed on 10 October 1939 with General Walther von Reichenau in command. 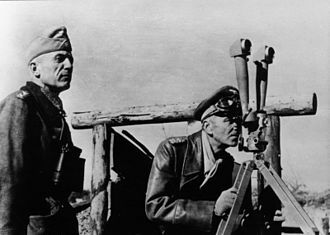 Its primary mission was to guard the western defenses of Germany against British and French attacks during the Polish campaign. 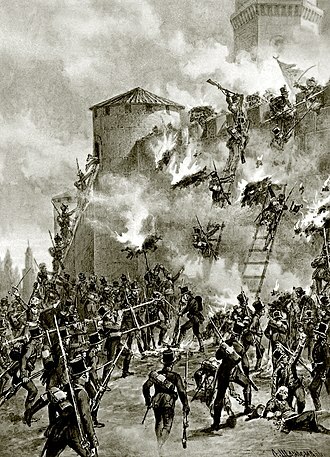 During the invasion of the Low Countries the 6th Army saw active service linking up with paratroopers and destroying fortifications at Eben Emael, Liège, and Namur during the Battle of Belgium. 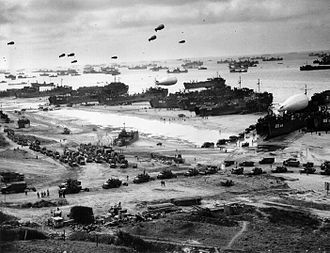 The 6th Army was then involved in the breakthrough of the Paris defences on 12 June 1940, before acting as a northern flank for German forces along the Normandy coast during the closing stages of the Battle of France. 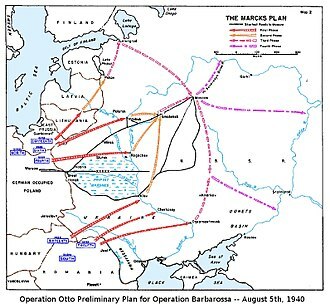 The 6th Army took part in Operation Barbarossa as the spearhead of Army Group South. Reichenau died in an aircraft accident while being transported to a hospital after a heart attack in January 1942. 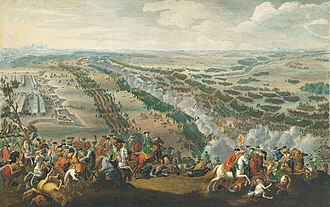 He was succeeded by his former chief of staff, General Friedrich Paulus. Paulus led the 6th Army to a major victory at the Second Battle of Kharkov during the spring of 1942. 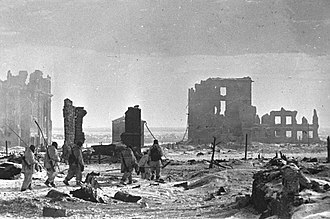 Stalingrad was defended by the 62nd Army (Soviet Union) under the command of General Vasily Chuikov. Despite German air superiority over Stalingrad, and with more artillery pieces than the Red Army, progress was reduced to no more than several meters a day. 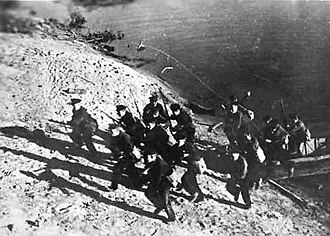 Eventually, by mid November, the 62nd Army had been pushed to the banks of the Volga, but the 6th Army was unable to eliminate the remaining Soviet troops. 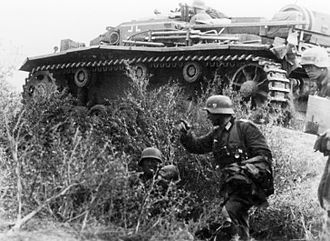 On 19 November the Stavka launched Operation Uranus, a major offensive by Soviet forces on the flanks of the German army. The first pincer attacked far to the west of the Don, with the second thrust beginning a day later attacking far to the south of Stalingrad. The 6th Army's flanks were protected by Romanian troops, who were quickly routed, and on 23 November, the pincers met at Kalach-na-Donu, thereby encircling 6th Army. A relief attempt was launched on 12 December, codenamed Operation Winter Storm, but this failed. The army surrendered between 31 January and 2 February 1943. 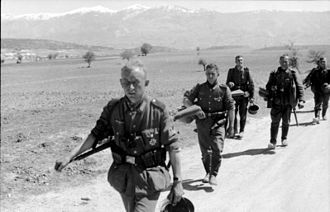 German casualties are 147,200 killed and wounded and over 91,000 captured, the latter including 24 generals and 2,500 officers of lesser rank. Only 5,000 would return to Germany after the war. The army was reformed by renaming Armee-Abteilung Hollidt on 5 March 1943 under the command of General Karl-Adolf Hollidt. 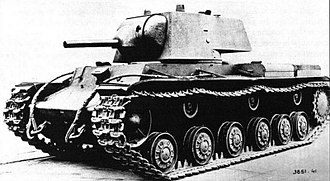 It later fought in Ukraine and Romania as part of Army Group South until transferred to Army Group A (later renamed to Army Group South Ukraine). 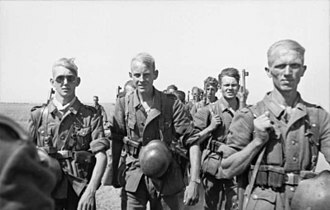 In May 1944, the 6th Army became part of Army Group Dumitrescu, commanded by the Romanian general Petre Dumitrescu. 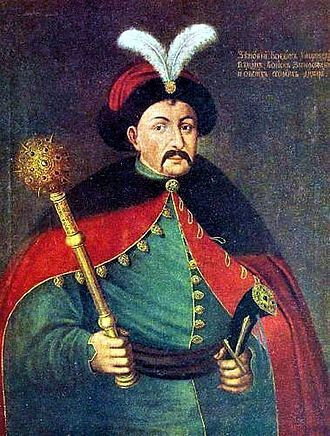 The Army Group also included the Romanian 3rd Army. This instance marked the first time in the war when German commanders came under the actual (instead of nominal) command of their foreign allies. This came one month after Dumitrescu became the 5th non-German recipient of the Knight's Cross of the Iron Cross with Oak Leaves (4 April 1944). 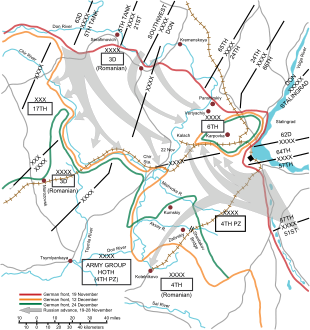 The 6th army was encircled and almost entirely destroyed during the Soviet Iassy-Kishinev Operation. In October 1944, under the command of General Maximilian Fretter-Pico, the 6th Army encircled and destroyed three Soviet corps of Mobile Group Pliyev under the command of Issa Pliyev in the Battle of Debrecen. 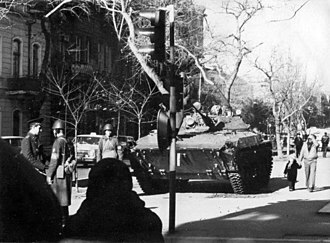 During this time, the 6th Army had the Hungarian Second Army placed under its command, and it was known as "Army Group Fretter-Pico" (Armeegruppe Fretter-Pico). Command passed to General Hermann Balck in 23 December 1944. In December 1944, one of the 6th Army's subordinate units, the IX SS Mountain Corps, was encircled in Budapest. 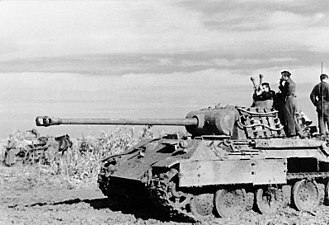 IV SS Panzer Corps was transferred to the 6th Army's command and a series of relief attempts, codenamed Operation Konrad, was launched during the 46-day-long Siege of Budapest. After the failure of Konrad III, the 6th Army was made part of "Army Group Balck" (Armeegruppe Balck). This army group fell back to the area near Lake Balaton. 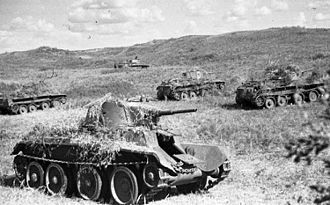 Several units, including the III Panzer Corps, took part in Operation Spring Awakening, while the rest of the Sixth Army provided defence for the left flank of the offensive, in the region west of Székesfehérvár. After the failure of the offensive, the army held the line until the Soviet Vienna Offensive on 16 March 1945. This offensive tore a gap in the 6th Army between the IV SS Panzer Corps and the 3rd Hungarian Army (subordinated to Balck's command), shattering the formation. 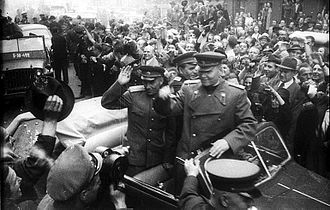 By the end of March 1945, the 6th Army was retreating towards Vienna. It surrendered to the U.S. Army on 9 May 1945. Soon after the beginning of Operation Barbarossa, the Sixth Army's surgeon, the staff doctor Gerhart Panning, learned about captured Russian dumdum bullets by using Jewish POWs. To determine the effects of this type of ammunition on German soldiers, he decided to test them on other human beings after asking SD member and SS-Standartenführer Paul Blobel for some "guinea pigs" (Jewish POWs). "The rooms were filled with about 90 children. There was an indescribable amount of filth; Rags, diapers, refuse lay everywhere. Countless flies cover the children, some of whom were naked. Almost all of the children were crying or whimpering. The stench was unbearable. In the above mentioned case, measures were taken against women and children which were no different from atrocities committed by the enemy.". 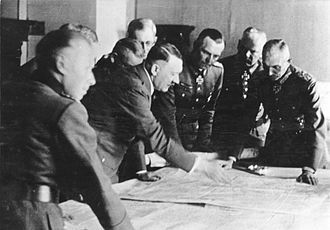 Sixth army headquarters was faced with a decision on what to do with the children left behind now that their parents had been murdered. 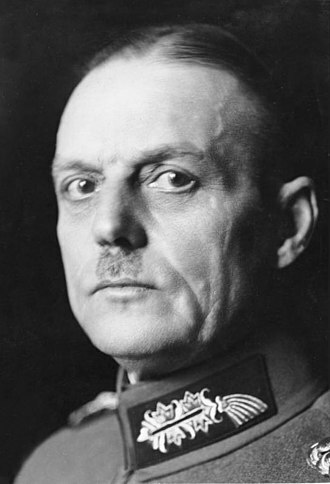 The division commander passed the decision up to Walter von Reichenau, then commander of the Sixth Army, who personally authorized the massacre. :06:54 All the children were murdered:07:27 by Sixth Army regulars. "The soldier in the eastern territories is not merely a fighter according to the rules of the art of war but also a bearer of ruthless national ideology and the avenger of bestialities which have been inflicted upon German and racially related nations. Therefore the soldier must have full understanding for the necessity of a severe but just revenge on subhuman Jewry. 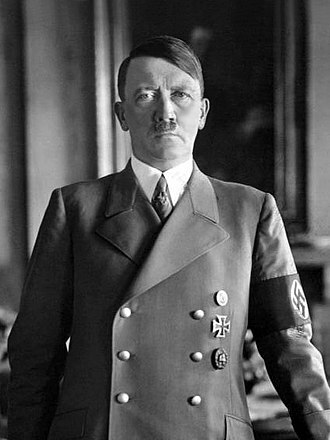 The Army has to aim at another purpose, i.e., the annihilation of revolts in hinterland which, as experience proves, have always been caused by Jews...". The Sixth Army confiscated large quantities of food to be used by its troops, creating acute food shortages in the Ukraine. 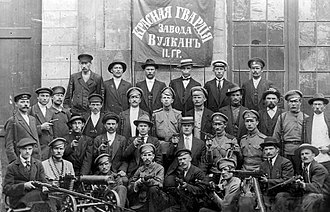 By January 1942 around one-third of the Kharkov's 300,000 remaining inhabitants suffered from starvation. Many would die in the cold winter months. Civilians survived the famine by making stews out of boiled leather and sawdust, and making omelets out of coagulated blood. Survivors bitterly remembered these "meals" for the rest of their lives. ^ a b Shirer 1960, p. 838. ^ Ziemke 2002, p. 69. ^ Adam & Ruhle 2015, pp. 1-2. ^ Ziemke & Bauer 1987, p. 158. ^ Ziemke 2002, p. 33. ^ Ziemke 2002, p. 18. ^ Ziemke 2002, pp. 15-16. ^ Ziemke 2002, pp. 40-41. ^ Ziemke 2002, p. 42. ^ Ziemke 2002, p. 46. ^ Ziemke 2002, p. 53. ^ Ziemke 2002, pp. 53-54. ^ Ziemke 2002, p. 57. ^ Ziemke 2002, pp. 63-64. ^ a b Ziemke 2002, p. 79. ^ Ziemke 2002, p. 137. ^ Ziemke 2002, p. 242. ^ Ziemke 2002, pp. 353-355. ^ Ziemke 2002, p. 362. ^ Ziemke 2002, p. 385. ^ Ziemke 2002, pp. 384-386. ^ Ziemke 2002, p. 386. ^ Ziemke 2002, pp. 433-437. ^ Ziemke 2002, p. 452. ^ Ziemke 2002, p. 453. ^ Ziemke 2002, p. 455. ^ a b c d "The Wehrmacht: Warcrimes (part 2)". BBC. Retrieved 3 November 2013. ^ "The Wehrmacht: Warcrimes (part 1)". BBC. Retrieved 3 November 2013. Adam, Wilhelm; Ruhle, Otto (2015). With Paulus at Stalingrad. Translated by Tony Le Tissier. United Kingdom: Pen and Sword Books Ltd. ISBN 9781473833869. Boll, Bernd; Safrian, Hans (2004). "On the Way to Stalingrad". In Hannes Heer; Klaus Naumann (eds.). War Of Extermination: The German Military In World War II. New York: Berghahn Books. pp. 237–271. ISBN 1-57181-232-6. Shirer, William L. (1960). The Rise and Fall of the Third Reich. United States: Simon & Schuster. ISBN 0-671-72868-7. Babi Yar is a ravine in the Ukrainian capital Kiev and a site of massacres carried out by German forces and local collaborators during their campaign against the Soviet Union. The most notorious and the best documented of these took place 29–30 September 1941. It was carried out by Sonderkommando 4a soldiers, along with the aid of the SD, victims of other massacres at the site included Soviet prisoners of war, Ukrainian nationalists and Roma. It is estimated that between 100,000 and 150,000 people were killed at Babi Yar during the German occupation, the Babi Yar ravine was first mentioned in historical accounts in 1401, in connection with its sale by baba, the cantiniere, to the Dominican Monastery. 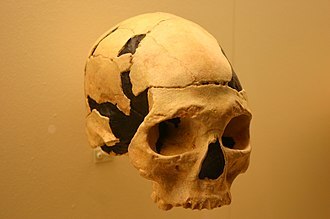 The word yar is Turkic in origin and means gully or ravine, in the course of several centuries the site had been used for various purposes including military camps and at least two cemeteries, among them an Orthodox Christian cemetery and a Jewish cemetery. The latter was closed in 1937. Axis forces, mainly German, occupied Kiev on 19 September 1941, between 20 and 28 September, explosives planted by the Soviet NKVD caused extensive damage in the city, on 24 September an explosion rocked Rear Headquarters Army Group South. 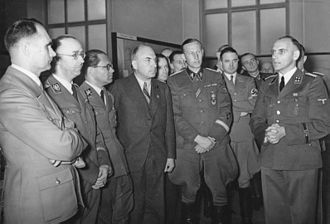 Two days later, on 26 September, Maj. Gen. Kurt Eberhard, the governor, and SS-Obergruppenführer Friedrich Jeckeln. 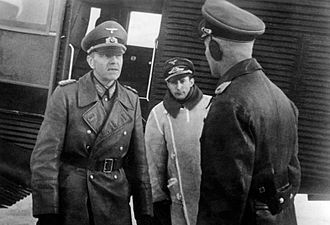 There, they made the decision to exterminate the Jews of Kiev, present were SS-Standartenführer Paul Blobel, commander of Sonderkommando 4c, and his superior, SS-Brigadeführer Dr. Otto Rasch, commander of Einsatzgruppe C. The mass killing would be carried out by units under the command of Rasch and Blobel, the implementation of the order was entrusted to Sonderkommando 4a, commanded by Blobel, under the general command of Friedrich Jeckeln. This unit consisted of SD and Sipo, the company of the Special Duties Waffen-SS battalion. 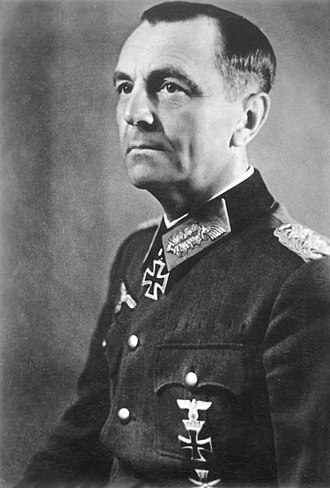 Police Battalion 45, commanded by Major Besser, conducted the massacre, contrary to the myth of the clean Wehrmacht, the Sixth Army under Walter von Reichenau worked together with the SS and SD to plan the mass murder of the Jews of Kiev. An order was posted, All Yids of the city of Kiev and its vicinity must appear on Monday, September 29, by 8 oclock in the morning at the corner of Melnikova, bring documents and valuables, and warm clothing, etc. Baku is the capital and largest city of Azerbaijan, as well as the largest city on the Caspian Sea and of the Caucasus region. Baku is located 28 metres below sea level, which makes it the lowest lying national capital in the world and it is located on the southern shore of the Absheron Peninsula, alongside the Bay of Baku. At the beginning of 2009, Bakus urban population was estimated at just over two million people, about 25 percent of all inhabitants of the country live in Bakus metropolitan area. Baku is divided into administrative districts and 48 townships. Among these are the townships on the islands of the Baku Archipelago, the Inner City of Baku, along with the Shirvanshahs Palace and Maiden Tower, were inscribed as a UNESCO World Heritage Site in 2000. According to the Lonely Planets ranking, Baku is among the top ten destinations for urban nightlife. The city is the scientific and industrial center of Azerbaijan, many sizeable Azerbaijani institutions have their headquarters there. The Baku International Sea Trade Port is capable of handling two million tons of general and dry bulk cargoes per year, in recent years, Baku has become an important venue for international events. The city is renowned for its winds, which is reflected in its nickname. Indeed, the city is renowned for its fierce winter snow storms and this is reflected in the citys nickname as the City of Winds. 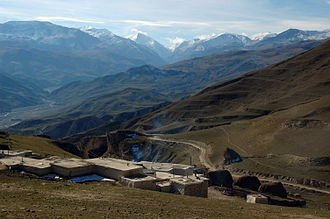 A less probable folk etymology explains the name as deriving from Baghkuy and kuy are the Old Persian words for god and town respectively, the name Baghkuy may be compared with Baghdād in which dād is the Old Persian word for give. Arabic sources refer to the city as Baku, Bakuya, around 100,000 years ago, the territory of modern Baku and Absheron was savanna with rich flora and fauna. 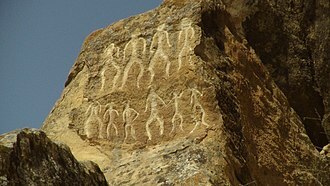 Traces of human settlement go back to the Stone age, from the Bronze age there have been rock carvings discovered near Bayil, and a bronze figure of a small fish discovered in the territory of the Old City. 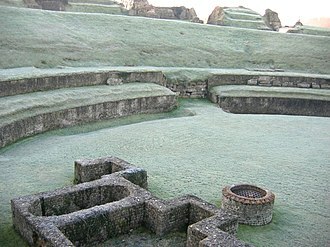 These have led some to suggest the existence of a Bronze Age settlement within the citys territory, further archeological excavations revealed various prehistoric settlements, native temples and other artifacts within the territory of the modern city and around it. The Volga is the longest river in Europe. It is Europes largest river in terms of discharge and watershed, the river flows through central Russia and into the Caspian Sea, and is widely regarded as the national river of Russia. Eleven of the twenty largest cities of Russia, including the capital, some of the largest reservoirs in the world can be found along the Volga. The river has a meaning in Russian culture and is often referred to as Волга-матушка Volga-Matushka in Russian literature and folklore. 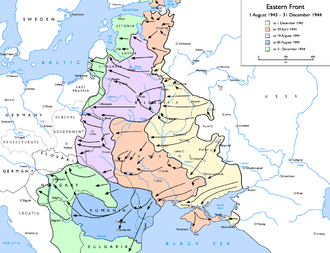 The Slavic name is a translation of earlier Scythian Rā Volga, literally wetness, cognate with Avestan Raŋhā mythical stream and Sanskrit rasā́- dew, juice. 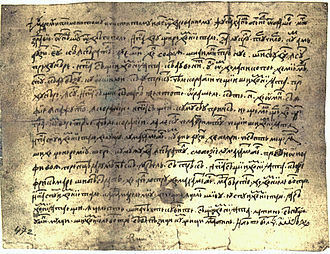 The Scythian name survives in modern Mordvin Rav Volga, the Turkic peoples living along the river formerly referred to it as Itil or Atil big river. In modern Turkic languages, the Volga is known as İdel in Tatar, Атăл in Chuvash, Idhel in Bashkir, Edil in Kazakh, the Turkic peoples associated the Itils origin with the Kama. Thus, a tributary to the Kama was named the Aq Itil White Itil which unites with the Kara Itil Black Itil at the modern city of Ufa. The name Indyl is used in Adyge language, among Asians, the river was known by its other Turkic name Sarı-su yellow water, but the Oirats used their own name, Ijil mörön or adaptation river. Presently the Mari, another Uralic group, call the river Jul, they called the river Volgydo, a borrowing from Old Russian. 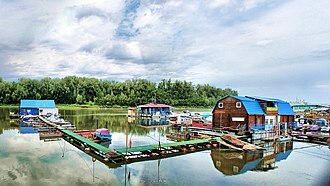 The Volga is the longest river in Europe and it belongs to the closed basin of the Caspian Sea, being the longest river to flow into a closed basin. From there it turns south, flows past Ulyanovsk, Samara and Volgograd, at its most strategic point, it bends toward the Don. 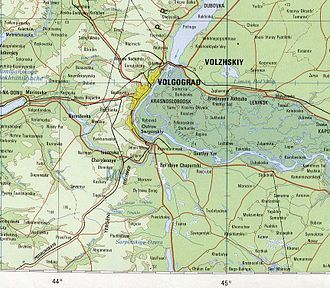 Volgograd, formerly Stalingrad, is located there, the Volga has many tributaries, most importantly the rivers Kama, the Oka, the Vetluga, and the Sura. The Volga and its tributaries form the Volga river system, which flows through an area of about 1,350,000 square kilometres in the most heavily populated part of Russia. The Volga Delta has a length of about 160 kilometres and includes as many as 500 channels, the largest estuary in Europe, it is the only place in Russia where pelicans and lotuses may be found. Panorama of the city of Liège. Photo taken from the heights of the Citadel (left bank of the River Meuse).